2018 has been a big year, especially as it is the 125th anniversary of the New Zealand’s Women’s Suffrage movement! To celebrate 125 years of New Zealand women’s right to vote, we thought it would be a great opportunity to tell the story of how far women have come since 1893 in a simple, inspiring and uplifting way. With help from funding from the Ministry for Women, we created a series of ‘pocket-sized’ animations for people to watch, enjoy and share with others on social media. The concept for our ‘It’s Choice!’ animations was to highlight the amount of choices available to women today compared with those available in 1893. We split this message over three, 30-second long, videos that covered different areas of a woman’s life: career, education, and recreation. Realms that have changed dramatically over the last century. As we were showing a comparison over a span of time the animations adopted a timeline approach, with each scene panning through 1893 to 2018. A simple illustration style and palette were used for the elements dotted along the timeline. These represented the landscape for women at various times throughout the last 125 years, recognising the norm for generations before and the possibilities beyond today. If you’re quick you might even spot our PM making a guest appearance in one of the scenes. These animations have now been shared nearly 500 times over various social media channels including Facebook, LinkedIn, Instagram and Twitter. We’re so proud to have helped provide this generation with a tool to honour those who campaigned and secured the right to vote. The future for women is all about choice. We even had Helen Clark like one of the animations – now that must mean we’ve made it! 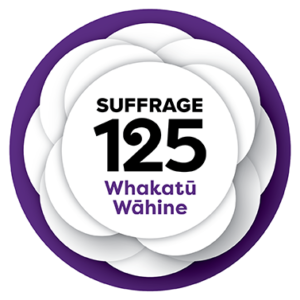 Proudly supported by the Ministry for Women, New Zealand’s Suffrage 125 Community Fund.